100% polyester reflective trucker cap. Five-panel, structured mid-profile. 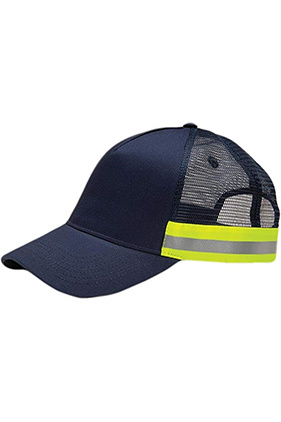 High-visibility color crown with matching color mesh side and back panels. High-visibility contrast color taping with reflective grey center stripe on bottom side panels. Pre-curved visor with low glare grey twill under visor and sweatband. Matching color plastic snap closure. Hi-Vis colors meet ANSI Class 2 standards.